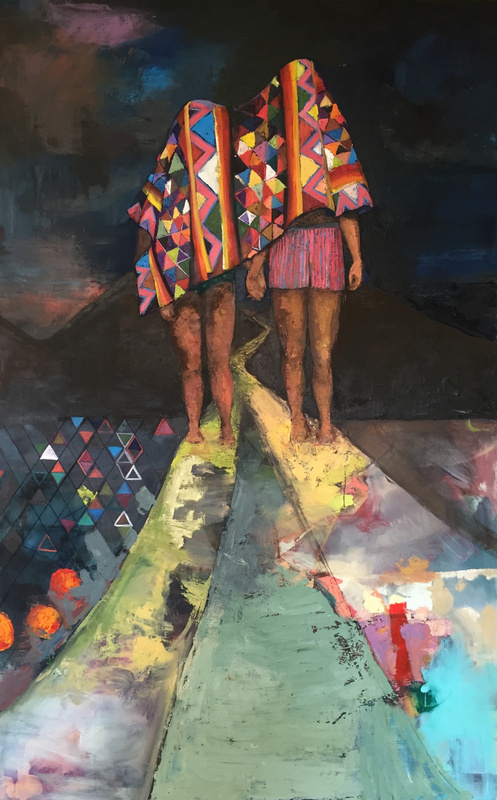 Katie Ruiz MFA 2015 was one of our Hohenberg Travel Award recipients of 2015. We asked her to share with us her experience. 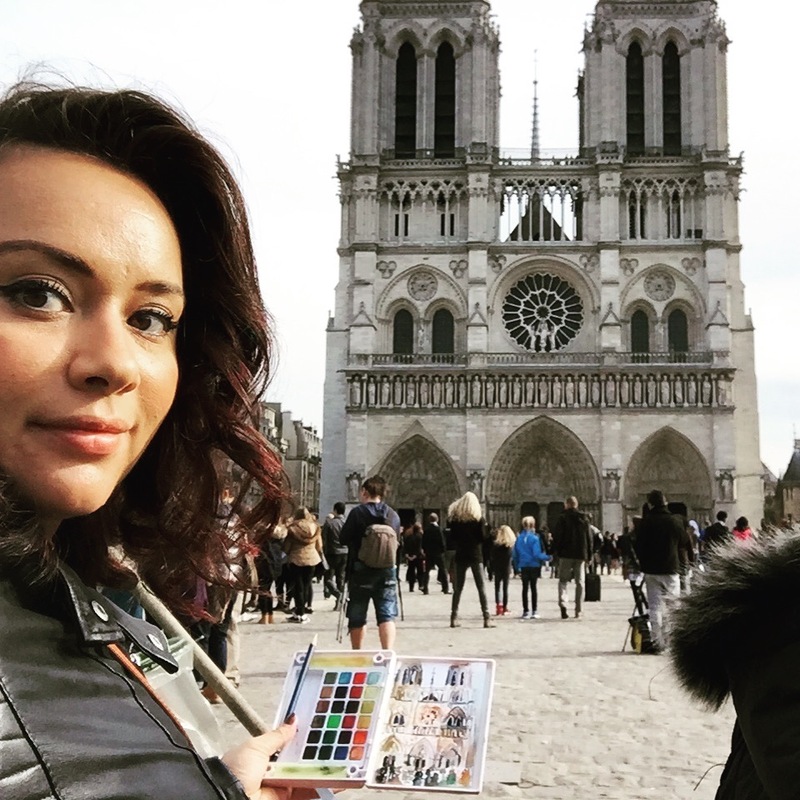 As the recipient of the Hohenberg travel scholarship I decided to travel to Paris. I stayed near Luxenburg Garden and walked all through the city every day. I purchased a 4 day museum pass which I highly recommend as it allows you to skip the lines and go directly into the museum. I started my art journey at the modern art museum the Pompidou. The high-tech architecture was stunning I took the escalator to the top and saw the view of the whole city. I enjoyed the works by Matise, Basquiat, Dubuffet, Cy Twombly, Francis Bacon and others. 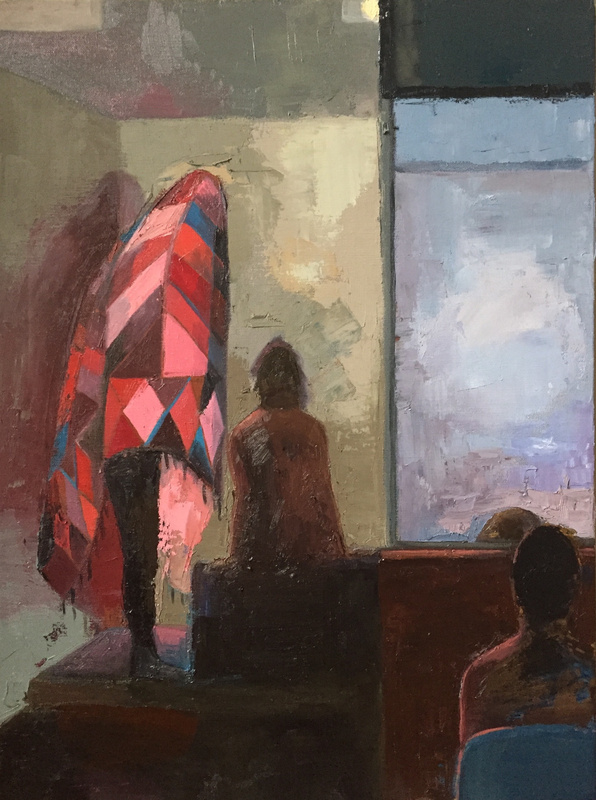 I learned about a new painter whose work I enjoyed very much by the name of Adrian Ghenie. His painting “Pie Fight Interior” was a big inspiration for me. Next I went to the Louvre and saw the new light work by artist Claude Lévêque. He created a red neon light travelling down the center of the large pyramid. Inside the Louvre my favorite paintings were the Leonardo Di Vinci pieces, besides the Mona Lisa of course which is wonderful to see but difficult to enjoy with all the crowds. I enjoyed the room of small very old 1300s paintings by Ambroginio Lorenzetti. 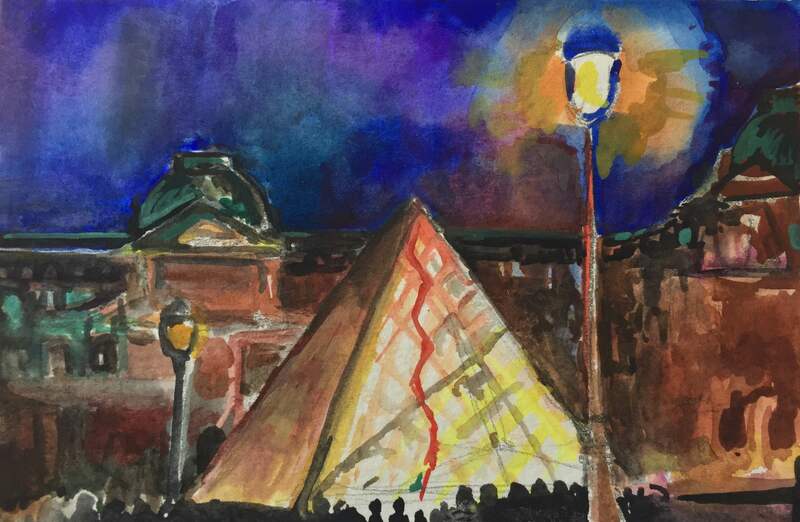 I took a travel watercolor set with me to Paris and painted the Louvre at night. 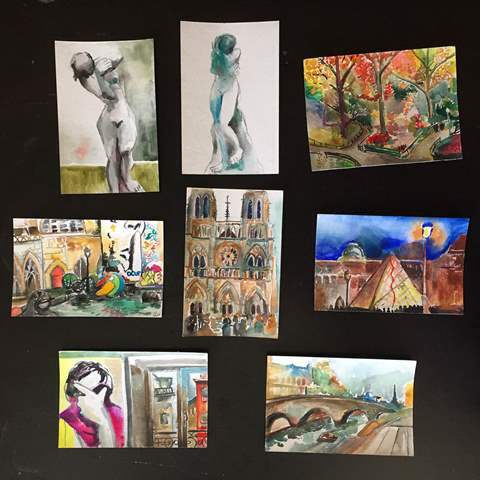 I did a small painting each day in different parts of the city. The next day I went to the Musée d’Orsay. This was a highlight of the trip for me because I got to see a few paintings I have had hanging in my studio for years as a reference. I was so excited by many of the paintings in the Musée d’Orsay. 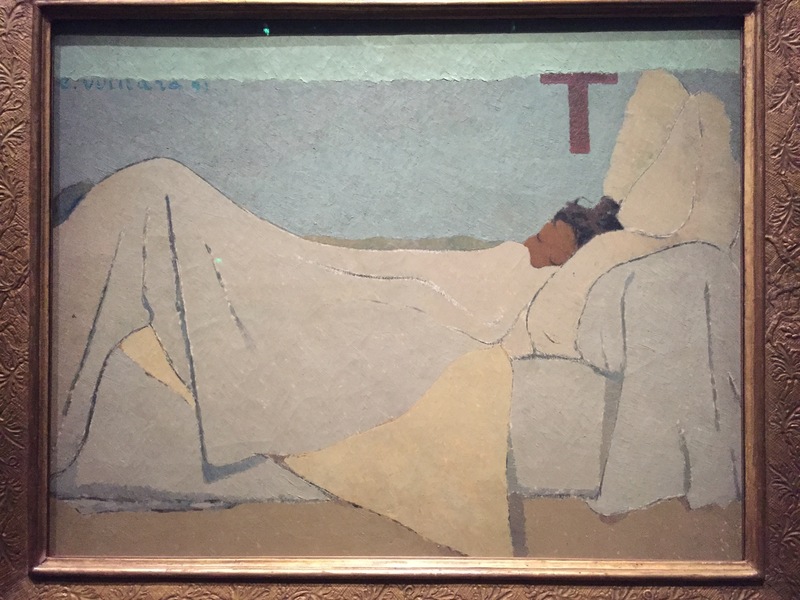 On the top on my list was a Vuillard painting called “In bed” which depicts a person sleeping in their bed in calm Naples yellow colors with blue light. 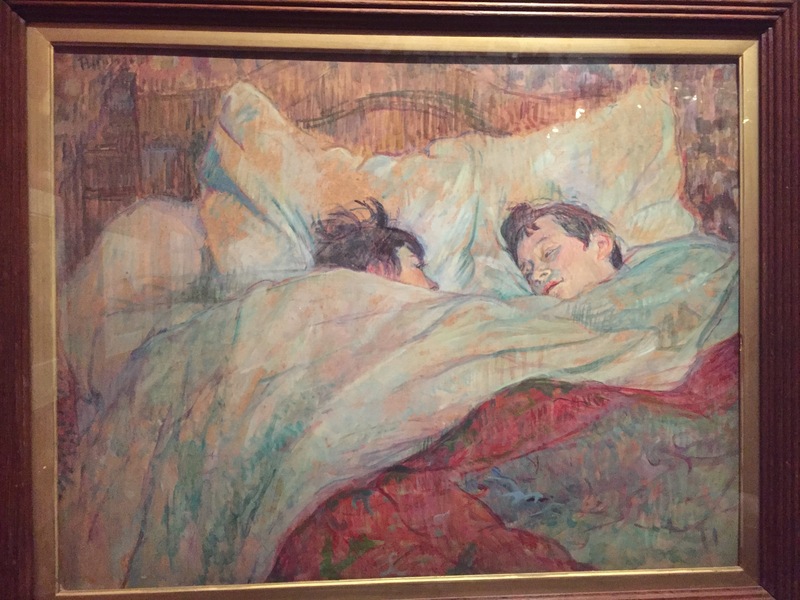 Another one of my favorite paintings I saw was “The bed” (1893) by Toulouse Lautrec and also Van Gogh’s painting “The bedroom” (1889). 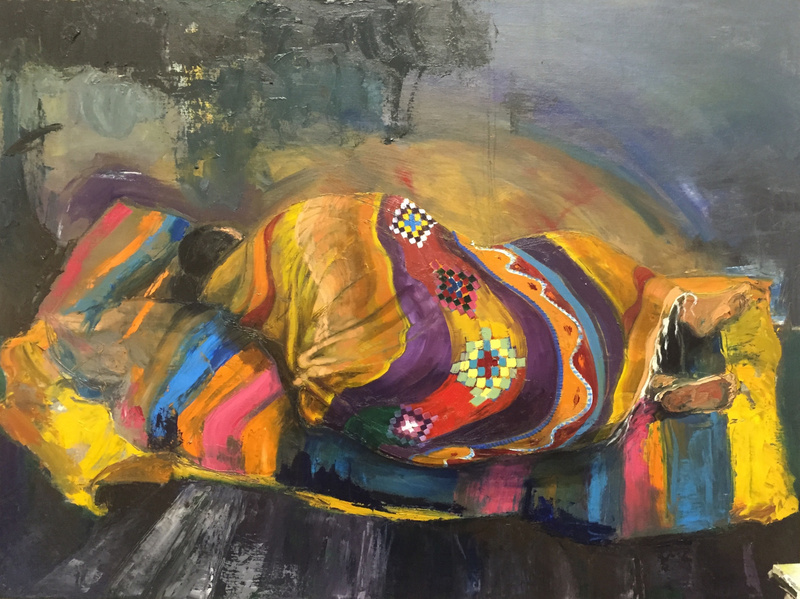 All of these were pieces I was studying when I was starting my blanket paintings last year at the NYSS. Other paintings I was excited to see were Manet’s “Olympia” and Courbet’s “Origin of the Universe,” Renoir’s “Bal du Moulin de la Galette” (1876). When I left the Musée d’Orsay I sat along the Seine and painted the bridge and the water. On the fourth day I went to the Musée Rodin. Unfortunately the main museum was closed but some of the sculptures were out and the garden was open. 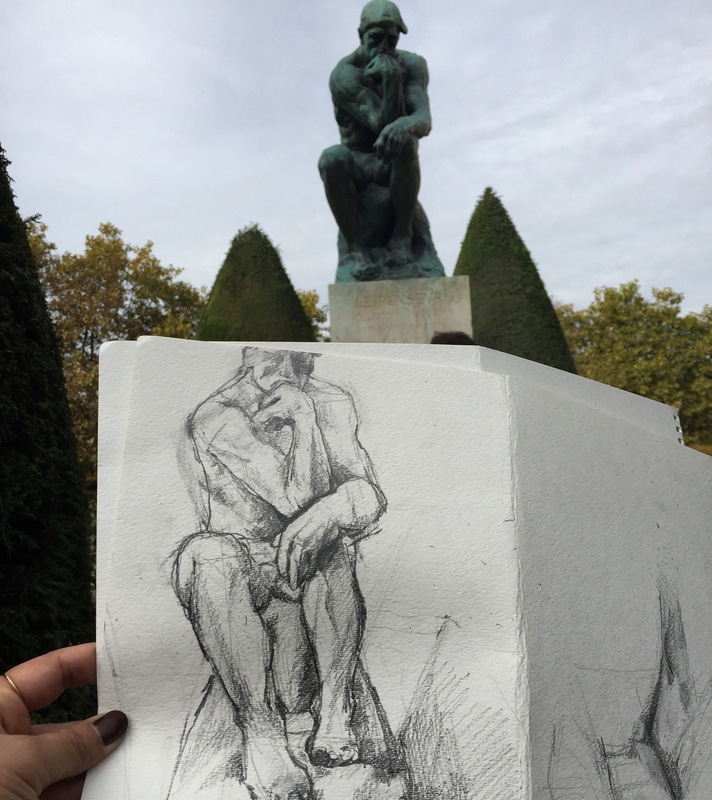 I spent the morning drawing from Rodin’s Thinker in the garden. 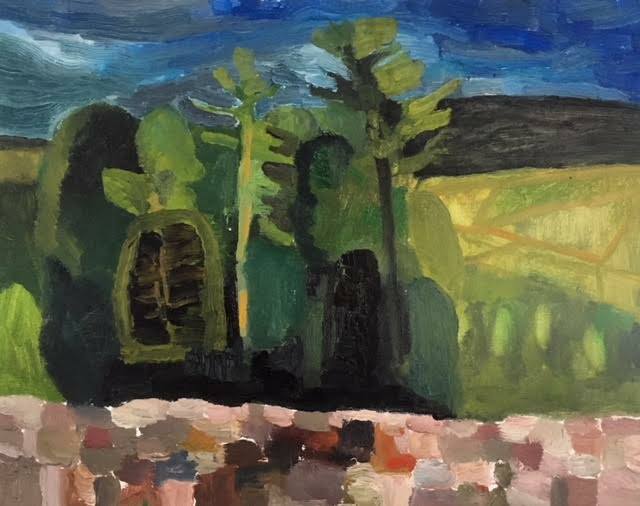 I walked through the gardens and made quick paintings from the sculptures. It was invigorating and inspiring. Later that day I went to Musée l’Orangerie to see the Monet murals. When I walked into the room of Monet murals chills flooded through my body and tears welled up in my eyes. I have never in my life seen anything so beautiful. It was one of the best moments of my life. Every day I was in Paris I encountered a painting that brought tears to my eyes. I saw art and architecture I have only ever seen in pictures in books I have studied and memorized and transcribed. In the Musée l’Orangerie I also really enjoyed the room of Chaïm Soutine Paintings. There was a large selection of the bird paintings that were gut wrenching and raw. 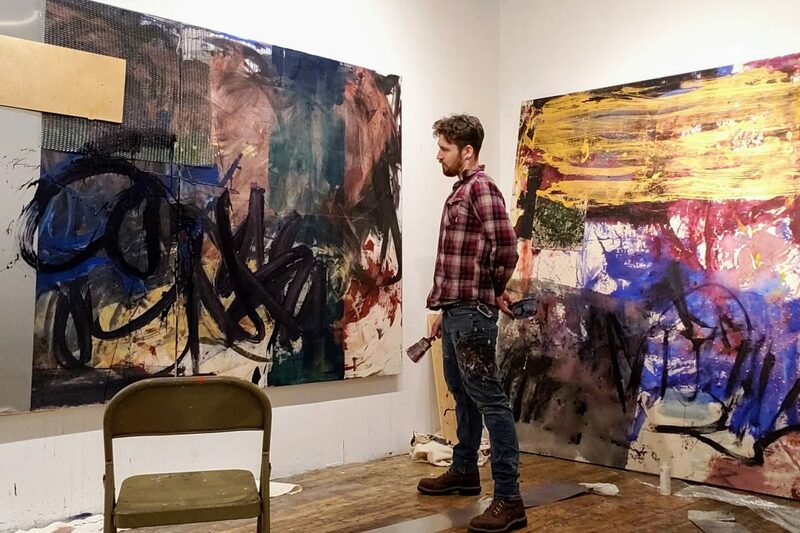 I love his brush strokes of thick paint and bright reds with blue grays. That night the galleries were open late to the public because FIAC art fair was going on. My friend Françoise and I went to several galleries. It was wonderful to see what is going on in the Paris art world and meet some gallery owners and artists. 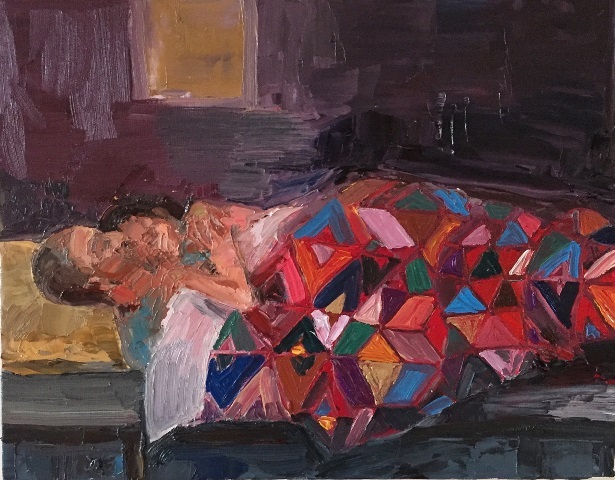 We went to Galerie Perrotin and saw new paintings by Hernan Bas and hyper realistic sculptures by Pierre Paulin. The rest of the weekend was spent going to FIAC held at the Grand Palace to look at modern art at the France International Art Convention. I saw many artists I like very much such as George Condo, Louis Bourgeois, Sigmar Polke, Leon Golub and many more. Officielle was another part of FIAC held at Les Docks- Cité de la mode et tu Design. We took a boat along the Seine to get there. Officielle was filled with many gallery booths from Paris, Berlin, Los Angeles, New York, and Mexico. I spend the last morning drawing from Notre Dame and doing some sight seeing at the Eiffel tower. In the concord and all around the city there were sculptures and interactive art up for FIAC. This trip has been a true gift. 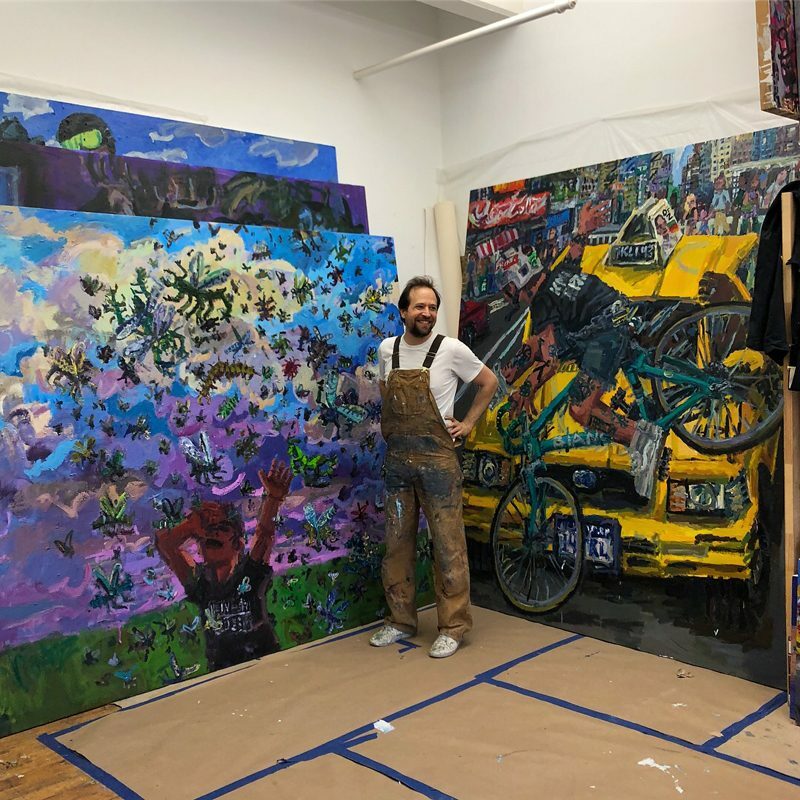 My world has been expanded and I feel inspired to create new paintings from all of the knowledge I have gained from this experience.